Vegan and gluten free tahini granola made with orange, oats, and seeds (no nuts!) for something a bit special in the mornings. 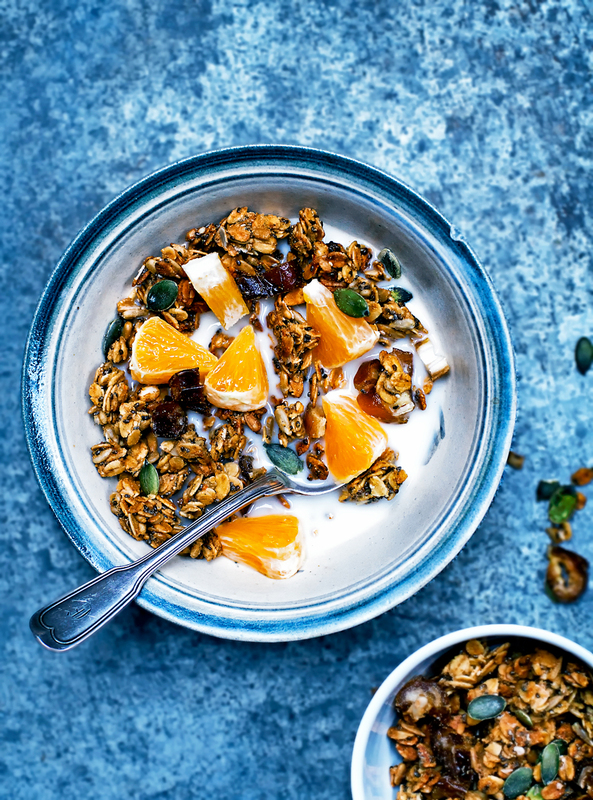 This wintery granola is sweetened with maple syrup and generously spiced for a nice warming flavour. This granola has been on rotation with my Olive Oil Granola for a couple of months now, since the first hints of citrus season. 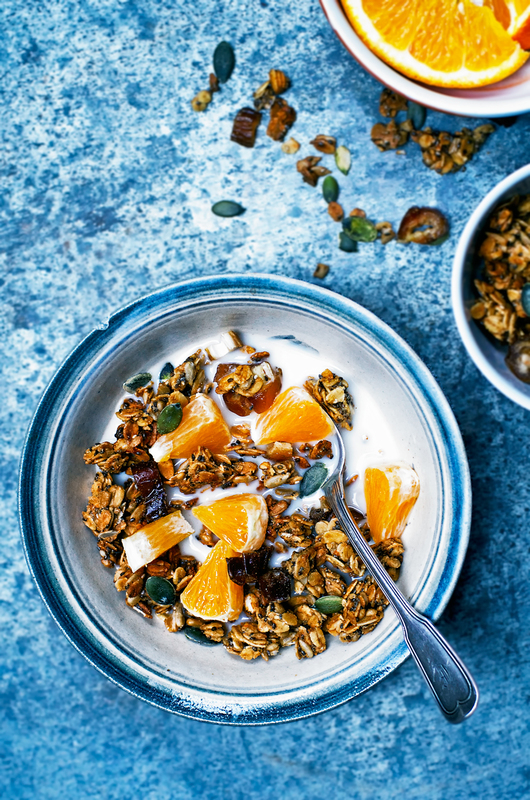 It’ll be my main granola for the next little while until oranges are gone for the season again – but I’m sure I’ll be happy to make a new seasonal favourite by then in any case. 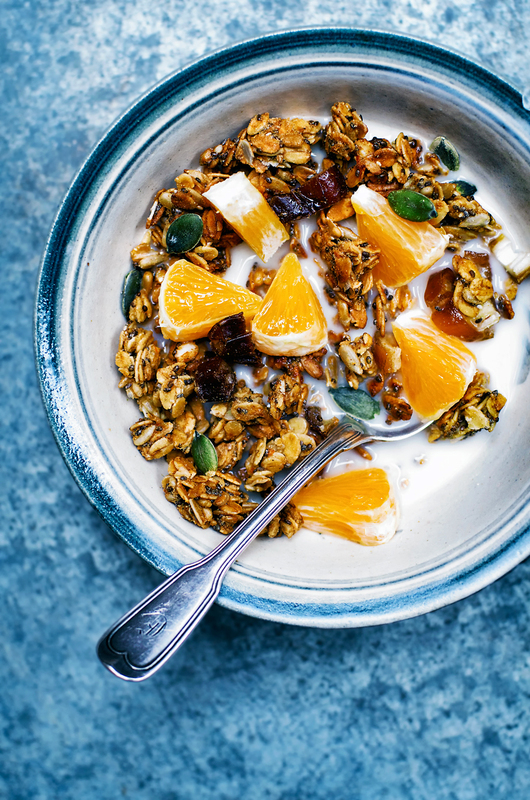 What flavours do you imagine in a springtime granola? I had written the idea for this recipe as using pistachios, but they’re just too expensive for me right now. Even pepitas are a little pricey, at least when compared to sunflower seeds. If you have pistachios they’re a nice option for this very middle-eastern inspired recipe. Tahini has really grown on me in the past year or so and I’ve included it here, along with dates, warm spices, and orange. It’s a nice little pick me up for these dark days until the sun comes back. I’m eating a couple of oranges a day right now (when in season!) so this granola is just a carrier for more citrus, hah. I like to have some granola in the house for a quick breakfast or snack, but Graham doesn’t like to bring it to work. Snacks in single servings only, thank you very much, but if you work at a desk job it’s good to bring with you. I used to always bring a container with a separate little bottle of nut milk and have it as my morning snack when I worked in an office, and now I just nibble right out of the jar most of the time. If you like granola with big clumps, I’ve got you covered. It cools into one big piece that you can break apart into any size you like, thanks to the chia and tahini. This isn’t particularly sweet, but granola shouldn’t be completely sugar laden anyway, right? 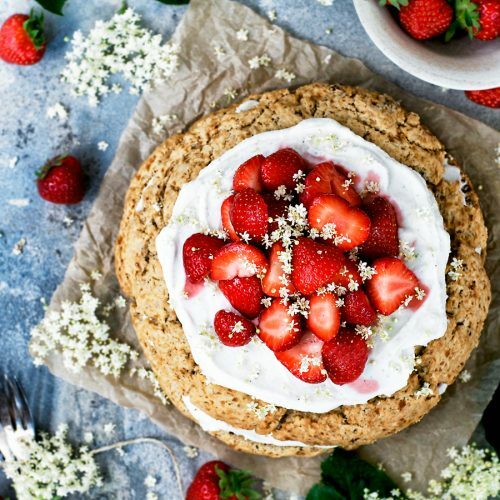 Just a little sweetness to have with fruit, like a proper müsli. On that note, yogurt is best with this, but apart from coconut I haven’t found a type I really like. Oatly has a great sort-of pourable yogurt but I can’t find it in Germany, and coconut yogurt is way too rich to have every day. For now I’m adding a little oat milk instead. Preheat the oven to 150C / 300F and line a large baking sheet with parchment paper. Place the oats, seeds, spices, and salt into a large bowl and stir. Add the honey, tahini, oil, zest, and orange juice, then use a wooden spoon or your hands to mix until fully combined. Transfer the granola to the prepared baking sheet and spread into an even layer. Bake for 30-35 minutes, or until golden. It will still be slightly sticky but will become crisp as it cools. Let the granola cool completely on the pan, then break apart and mix in the chopped dates. 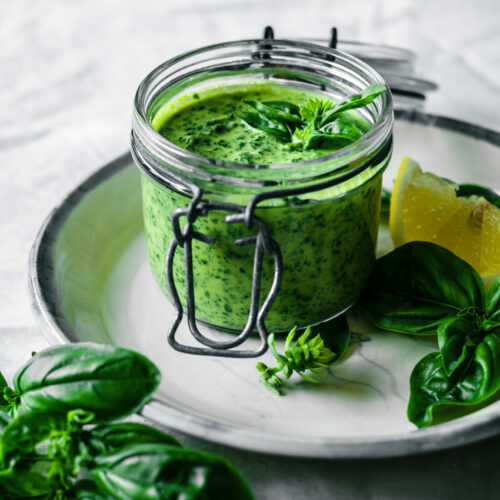 Transfer into a large sealed container and store at room temperature for up to a week, or a month in the refrigerator. * Use one pod of cardamom if you're using fresh. ** I've also made this with melted coconut oil and other light-tasting oils, and it always works. I like the flavour of the olive oil but if you don't, use coconut. 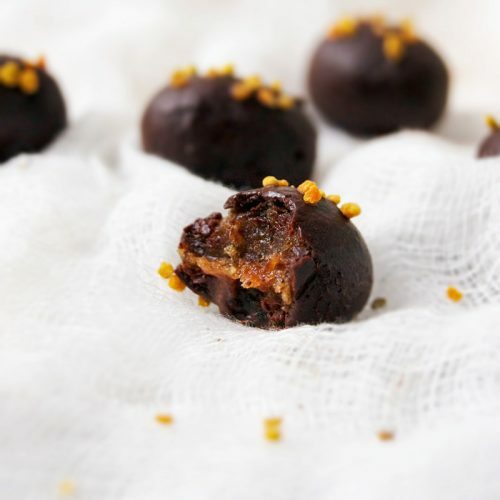 *** The dates tend to get a little burnt tasting if they're baked with the granola, so it's better to add them after cooking. Love tahini, dates and (clumpy) granola, this sounds perfect! Also, i assume i can substitute other juice/liquids for the orange juice if i happen not to have any on hand? I came across your blog a few months ago and love your posts. Thanks for the inspiration! Absolutely, it should be about 1/4 cup, and I'll update the recipe to reflect that. Yes, you could sub another juice, milk, or even water, but the orange juice adds a bit of sweetness so you may want to increase the sweetener just slightly if you use something other than juice. I'm so happy to hear it, thank you for being here!